Ships from and sold by MeiyaD. Unique and exclusive design bracelet for the nintendc swirtch joycon controller in the colors of just dance 2019, the most popular dance game of its generation. No need to hold your joy-in, insert it directly into your armband and dance freely. Ultra safe, the site has been specially designed to accommodate the joy cons and resist shock and shock; headband adaptable to all wrist sizes (child and adult). 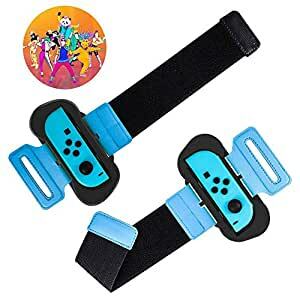 Adjustable elastic strap with space for Joy-Cons left or right. Designed for just dance, free your hands and fully enhance the game experience! I want to jump how to jump! Use a blue adjustable wrist strap with a black small handle to secure the joy-con handle to your wrist, no need to hold your Joy-Con. A djustable wristband can better meet the wearing size of children and adults, enjoy the joy of dancing with the family, and be suitable for the gift of the child.The product contains two control wristbands.